Why And How To Create A Mobile Based Website? It goes without saying that internet access has become very important nowadays, whether you are seeking information or need to get connected on a social platform. The latest buzz on the blocks is mobile internet, thanks to the number of updated versions of Smartphones, tablets and other mobile devices being added to the consumer market every passing day. Now, in order to retain their brand image, it is vital for businesses to develop user-friendly websites across a mobile platform, for the convenience of the increasingly mobile-savvy consumers. Mobile Internet has become the current battlefield for a number of designers and developers, simply due to the fact that traditional websites tailor-made for desktop compatibility will not function in the same manner as mobile devices. Regular websites are built for conventional web browsers and the fact is that mobile devices do not possess the same browsers or the same capabilities. Moreover, they are small, having diverse shapes and sizes, which makes it difficult for them to display conventional websites. Actually, the mobile website should be a much simpler version of the regular website. From the business perspective, let us understand briefly why companies are increasingly tending towards making their websites mobile-friendly. Be visible to your clients: There are many websites rich in video content and Flash, which register a poor performance when accessed through mobile devices. And with the grueling competition in the business world, businesses just cannot do with unpleasant user experience, because that may lead to client dissatisfaction and poor conversion rate. Enhance the Search Quotient: While using the search parameter on a mobile device, a distinct index solely meant for mobile content is accessed by the query. Since mobile search is still in the dormant phase, the indices are comparatively smaller and that implies that you have a smaller number of websites to compete with. Once you optimize your website for mobile devices, there are very good chances that you will rank high in the search engine result pages, now as well as in the future, when the competition gets tougher as the number of indices increases. Beat the Competition: With the number of mobile users increasing at a tremendous pace, it is obvious that web usage on mobile devices will hit a skyrocketing number in the coming years. So, now is the time for mobile optimization of websites, if you do not want to miss the opportunity of directing good amount of quality traffic to your website. Engage the Mobile-savvy Population: There are people whose best friends are their Smartphones, tablet or any other devices they are using. These mobile lovers always prefer to surf the net via mobiles rather than PCs. Unfortunately or fortunately, these mobile urbanites constitute a large portion of your target audience and it is highly difficult to target them through any medium other than the mobile. In other words without a mobile website, your business will fail to acquire the potential to capture this population with immense spending prospects. Be Successful with your Advertisements: Diverse studies have revealed that advertisements through mobiles have higher Click-through Rates (CTR) as compared to other online ads. Going by available data, mobile CTRs range from 5% to 15%, while PC based CTRs record an average of 2%. Given this scenario, mobile presence indeed adds a new dimension to internet marketing and offers adequate potential to reap optimum benefits from your marketing efforts. Local businesses like restaurants will get an effective and customer-friendly means to communicate with their target customers through mobile websites. With a mobile presence, e-commerce websites can reach out to their customers and turn selection and purchase of products into a very convenient experience for their end-users. Blogs and news websites need to constantly update, and sometimes make content available as fast as possible. 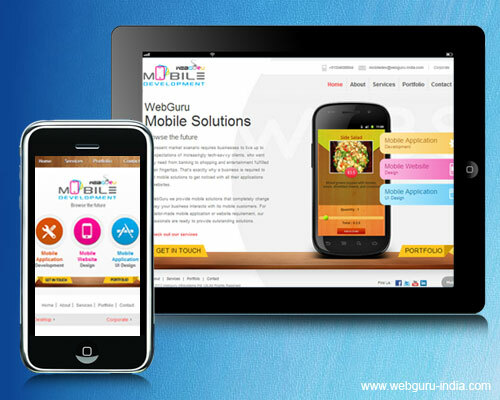 They can achieve their aim easily with a mobile website. Selection of an appropriate domain name: While choosing a domain name, you have three options. First, you can go for a domain name that is altogether different from the desktop version. This might not be a very good idea considering the fact that your loyal visitors are accustomed to the old address and you must have spent considerably to develop it. Shifting to a different domain might reduce your brand value. The second option is selecting a subdomain wherein you inform the visitors that you have come up with a mobile version of the site. The third option is going for a subfolder (such as mobiledev.webguru-india.com/mobile/) wherein the URLs are made as descriptive as possible (without being too lengthy), so that the users can get an idea about what to expect from a particular page. Choosing an outstanding layout: So far as the layout is concerned, the logo is one of the main things to be considered. It should be very attractive but the size should not exceed 2 KBs, otherwise it will take a lot of time to load, leading to user dissatisfaction. Also take care to keep the navigation as seamless as possible so that your website becomes highly mobile friendly. The navigation bar should always be placed at the top and must contain links to all important pages of the website. Being Short and Precise with the Content: Being too much creative with the content for a mobile website may lead to an unpleasant user-experience. Remember that most of the visitors are on the go when accessing mobile websites, so they won’t be interested in bulky content. The best way is to be as precise with the content as possible without leaving out important information. Select the content to be displayed and customize the menu so that visitors don’t need to zoom. If you want to include images, stick to the lightweight .GIF, .JPEG or .PNG formats and do not incorporate much graphics because it will result in considerable loading time. Moreover, try not to fill the pages with excessive ads. Being Careful with the Coding: You can code mobile websites with basic HTML, XHTML, XML and CSS. File names, heading tags, meta titles and description should be meticulously composed with the targeted keywords for optimizing the content. It is true that desktop browsers are more refined than mobile browsers and can evade certain programming errors while mobile browsers are not capable of doing so. So, it’s important for the developer to ensure 100% validity before a code is published. It is not always feasible to check the appearance of your site in all available mobile devices. To address this problem, you can go for fluid layouts that get automatically adjusted according to screen size. Style sheets can also be considered for targeting different mobile devices. Creating Applications: If your user base is large, it is advisable to build a dedicated application targeting diverse mobile interfaces. This is exactly what giant players like Gmail, Facebook, Yahoo, Twitter have done with great success. Alternatively you can create apps for specific handsets wherein you don’t need to bother about fancy scripts and can develop the application as you feel. Taking Care of Page Size and Page Links: Consider small page sizes for mobile websites, somewhere between 10KB to 25 KB. Remember that for accessing internet over the mobile, users subscribe to data plans that often charge as per the kilobyte consumed. Coming to the page links, do not let your visitors face the nightmare of ‘dead-ends’. Equip your site with ‘Back’ buttons and other relevant links so that each page is linked to some other page. Testing the Mobile Website: As the number of mobile devices with variety of screen resolutions keeps on increasing, there is still now no comprehensive solution that will hold good for every device. In order to minimize future problems, it is advisable to test the developed website on numerous devices across different platforms. With the ever increasing number of mobile internet users, the coming years will see new innovations in the field of mobile website design. 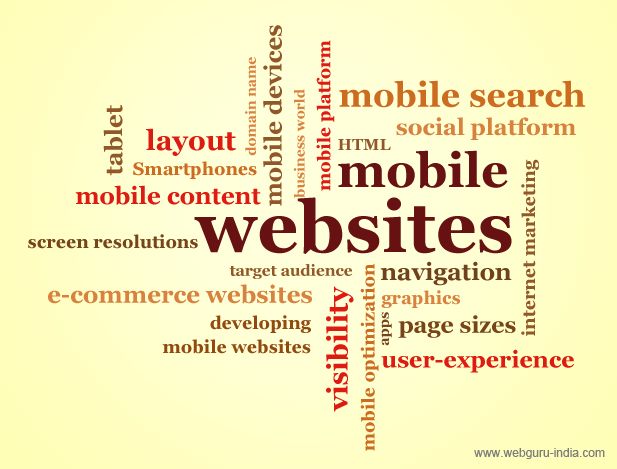 However, the fundamental aspect will remain more or less the same and should be thoroughly considered for developing mobile websites in order to address the growing needs of businesses to gain visibility. That is a good tip especially to those fresh to the blogosphere. Short but very precise information.Many thanks for sharing this one. A must read article! It’s actually a great and useful piece of information. I’m satisfied that you just shared this helpful information with us. Please stay us informed like this. Thanks for sharing. Nice Article about mobile website ! You have explained it amazingly.